I'm easing my arm back into the sewing swing of things, and this project was a great way to get back in the saddle. 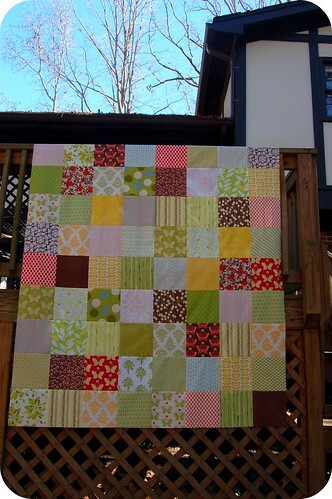 It's a simple patchwork quilt, made from an assortment of 8" squares in yellows and greens, with splashes of red, brown, and a smidgen of blue. Like the fabrics? I blogged all about my selection over on the Fat Quarterly blog today, and fat quarter bundles (selected by me!) 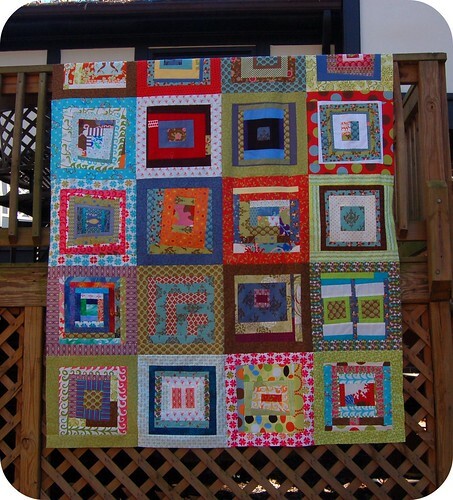 to make a similar quilt of your own are now available at Wish Upon a Quilt. I think I'm going to add 2 more columns and 2 more rows to make this more of a bed-sized quilt, and then get it off to the quilter ASAP. Wouldn't this be a great quilt for the Spring? A few weeks back I posted about a new project that I called the Undersea Quilt. 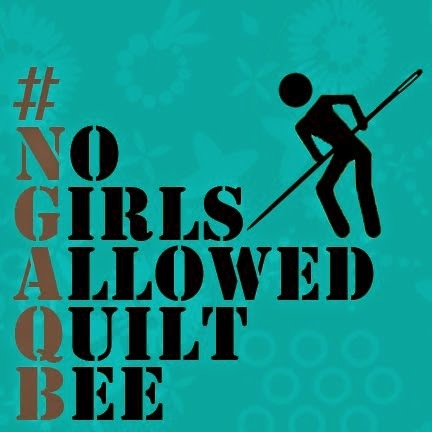 It was born out of a block swap that I organized with the members of the Triangle Modern Quilt Guild. Read more here. Since that time, I've added the entire left hand column and bottom row, made entirely from new blocks sent to me by my Twitter friends. I'm waiting on a few more blocks and will add another column. Isn't this quilt the coolest? It's rapidly becoming one of my favorites. Like, ever. Note to self: figure out a better way to hang quilts for pictures so that the entire top row isn't cut off! Blocks are 15" square each. I requested 12.5" wonky square-in-square / improv style blocks, and added a 2.5" frame around each block. Fabrics are an eclectic mix of Momo lines (Wonderland, Odyssea, Freebird, It's a Hoot, and Just Wing It) combined with some oliver + s Modern Workshop, solids, and anything else that the block-makers wanted to add! Here's a small embroidered piece that I recently completed for Cara as part of the Hoop Up! embroidery swap. 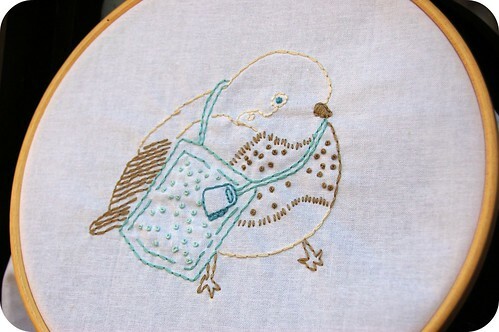 Cara requested images that combine two of her favorite things: tea, and birds. 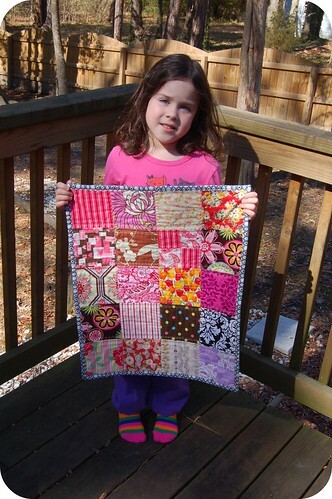 Her intent is to frame all of the pieces she receives in wooden hoops and hang them in her quilting nook. The image was adapted from a greeting card image that I came across in a Google Image search. Unfortunately, I still haven't been able to find an original source or the name of the artist. I would love to give proper credit, so if you have any information on this please let me know! ETA: Thanks for the tip, Gabrielle! This illustration is by Kate Wilson of Oodles of Doodles, a London-based illustrator. Sylvia hadn't quite understood the concept of the tea bag ... Where would her lipstick go? Hope Cara likes it! I have two more pieces to embroider to close out this round of the swap. Here's something from before the holidays that I haven't had a chance to share yet. 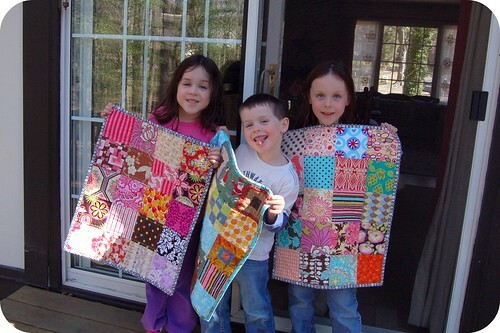 My kids (OK, really just my girls ... but little bro had t get in on the action) got it in their heads that they wanted to make themselves a doll quilt. Maybe it was seeing me work on my many projects. 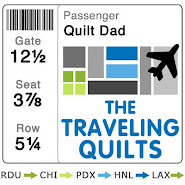 Maybe it was the anticipation of getting American Girl dolls for Christmas that would need their own little quilts. Likely, it was a combination of both. Anyway, those of you who have spent any amount of time with 6 year-old girls know that, once they get something stuck in their heads, they can be very persistent. So it didn't take long for them to wear me down convince me to help them make their quilts. After they made their selections and I trimmed up some squares, they laid the squares out themselves. Then it was time to sew them all together. Here's Megan with her quilt. 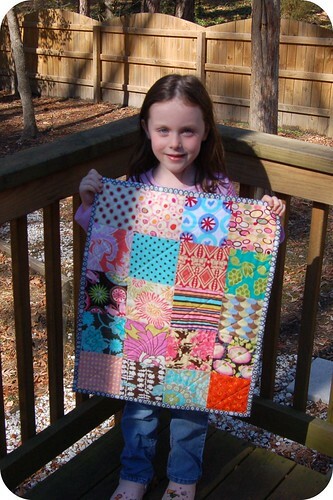 She was definitely the ringleader of this whole project and the one who most wanted to make her own quilt. She was also the one most interested in learning how to actually make the quilt. I taught her the basics of the sewing machine, lining pieces up right sides together, using the 1/4" guide on the sewing foot ... she really seemed interested and able to grasp all of it. I can definitely see her getting into sewing and quilting before too long! 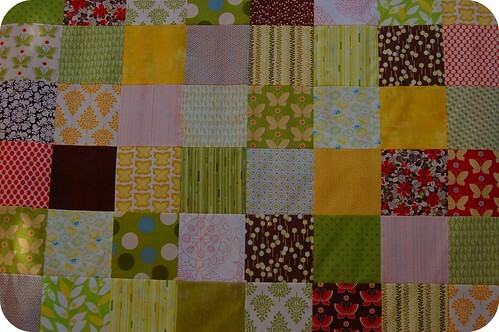 I quilted Megan's quilt in a diagonal cross-hatch pattern, cutting through the middle of each patch. And here's Bevin with her quilt that (unsurprisingly) prominently features flowers and the color pink. Bevin really enjoyed the process of picking out the fabrics and laying them out, and helped feed a few pieces through the machine, but otherwise really just wanted it to be finished so that she could have the final quilt. Let's just say that patience isn't her strong suit! I quilted Bevin's quilt in a basic straight-line outline / echo pattern. PS. Don't you just love the purple pants and the bright pink striped socks? That is SO her. 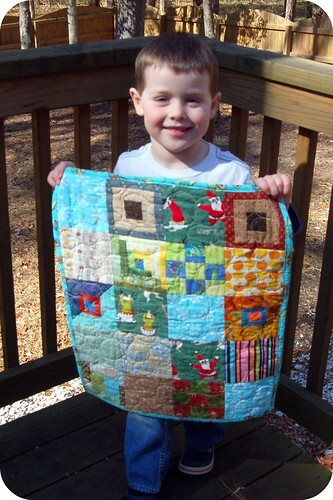 And finally, here's baby bro Sean with his quilt. He INSISTED on using the scraps of the Tammis Keefe print featuring Santa and his reindeer that Scott sent me. Luckily, he hasn't yet noticed that Santa is actually whipping those poor reindeer. I was also able to use some small pieced blocks that I had received in some block swaps, which I think add a cool element to the quilt. I quilted Sean's quilt with a large pebble pattern, which gives the quilt such a cool look. A little more masculine too, IMHO. Anyway, amidst the hustle and bustle of the holiday season, I was really happy to get to spend time with my kids and share this project with them. I know Anna and Eileen (new AG dolls) and Stitch (my son's most recent acquisition from DisneyWorld) are all happy to have their own quilts this winter, too! I know it's been a bit quiet around these parts. I haven't been able to sew much, what with the broken elbow and all. Sadly, I haven't been able to blog much either. But the good news is that my recovery has gone extremely well, and I have actually been making stuff to share with you all! I'll be working on getting that stuff posted soon. In the meantime, I happy to report that a podcast that I recorded a few months back is now live! All of which is why I was thrilled to meet Jackie at Quilt Market in Houston this past October. 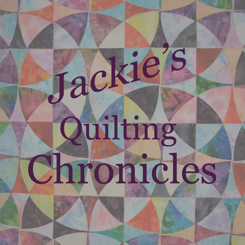 And when she asked me to be a guest on her podcast, Jackie's Quilting Chronicles, I was more than happy to oblige. The podcast is now available on Jackie's site. You can listen to it here. Check it out, and be sure to tell Jackie I said "hi"!